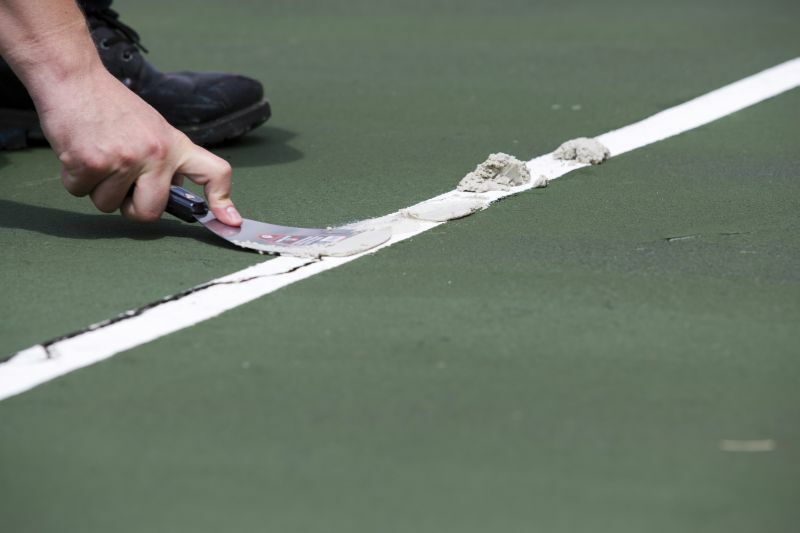 How To Fill Cracks On A Tennis Court | Which Products? SportMaster produces a variety of acrylic crack fillers and sealants for tennis courts and other recreational surfaces. 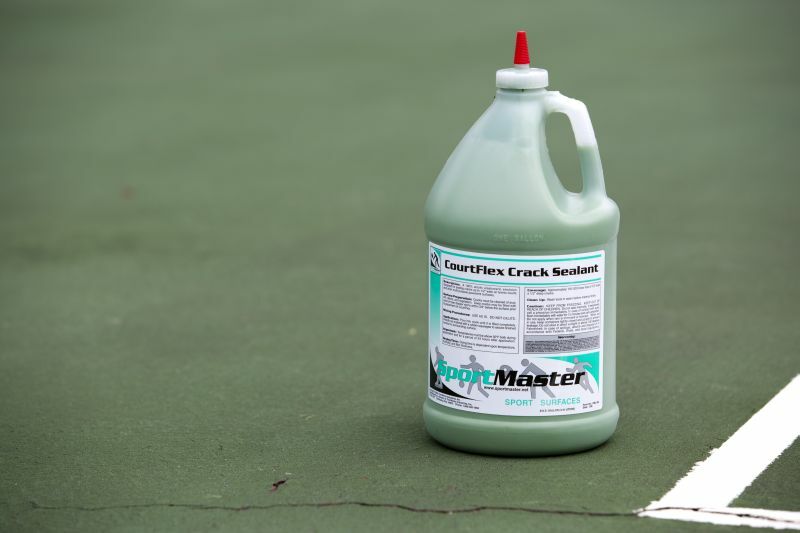 Many people ask us how to fill cracks on a tennis court and they want to know which crack repair products to use on their courts. Please keep in mind that these products and our surfacing systems are ideal for many different sports and game courts. Some of the more common ones include tennis, basketball, pickleball and netball. Here are some detailed descriptions of our ready-to-use acrylic crack repair products. Acrylic Crack Patch is a sand-filled crack filler for asphalt or concrete court surfaces. It can be used on cracks ranging from 1/8” up to 1” in width. This product is packaged in a one-gallon bucket and comes in Green, Red, Blue, and Neutral (which dries similar to the color of sand). Acrylic Crack Patch is heavy-bodied for bigger cracks and sets up hard and textured like the color coating surface. It is easy to apply with a putty knife and isn’t as “sticky” as some of the flexible elastomeric crack sealants. The non-sticky feel makes it easy to apply on very small cracks and it is simple to wipe away the excess surface residue with a slightly damp rag or sponge. Since it is sand-filled, it doesn’t have as much flexibility as some of the rubberized elastomeric crack sealants, and will likely re-crack under freeze-thaw conditions where there is much movement in the base of the court. CourtFlex Crack Sealant is a pourable acrylic crack filler, designed for smaller cracks up to ½” in width. It is packaged in a one-gallon jug with pour spout and is available in green, red, and neutral colors. It is very easy to apply, just cut the spout to the desired size and pour into the crack. CourtFlex is fortified with an elastomeric acrylic resin for a rubberized and flexible performance. This helps the product move with the crack during freeze-thaw expansion and contraction. 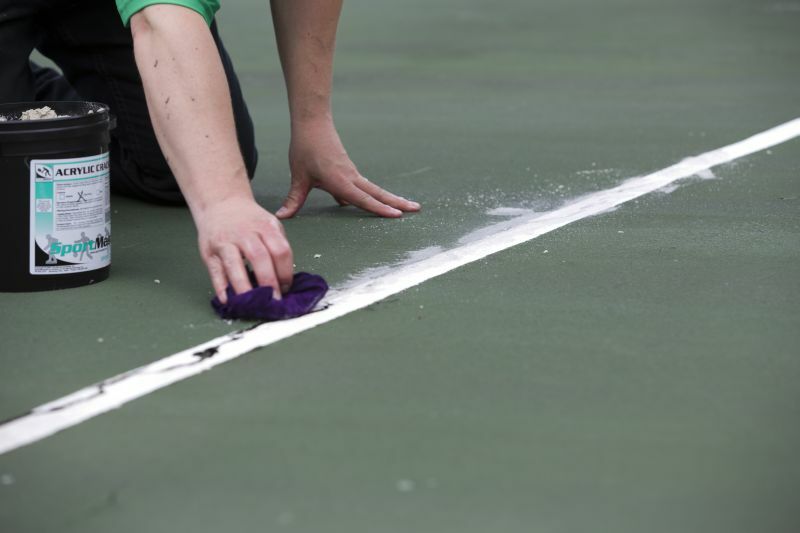 For best results, avoid getting CourtFlex on the surface or wipe clean before product dries to minimize any potential issues with player footing. Due to the pourable and flowing consistency of CourtFlex, additional coats may be needed as the sealant dries and settles down in the crack. CrackMagic is a very strong, yet flexible, acrylic crack filler for asphalt or concrete sport surfaces. The fiber-filled crack sealant exhibits an extremely strong bond to each side of the crack and sets up like rubber. Use CrackMagic on cracks with a maximum width of ½” and be sure to wipe off the surface before the material dries to prevent inconsistent surface texture. 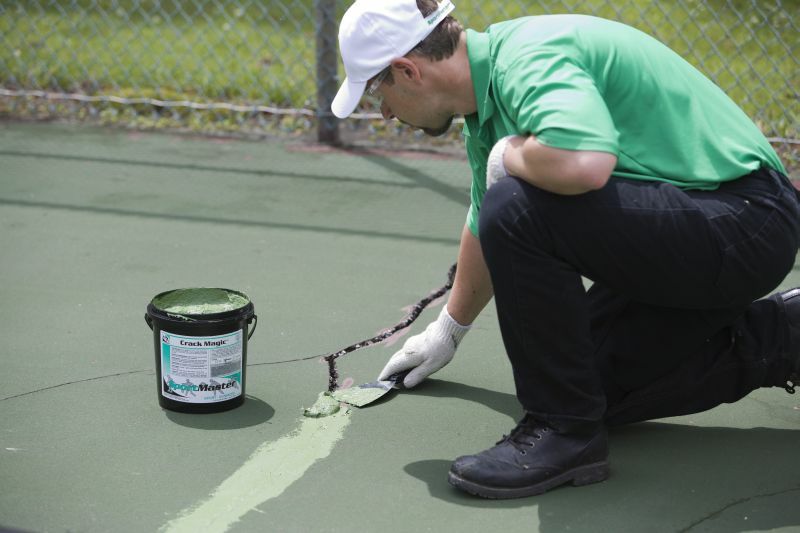 CrackMagic is a good solution for concrete expansion joints on tennis, basketball, and game courts. The product is packaged on one-gallon buckets and is available in green, red, and neutral. CrackMagic is especially good on cracks that exhibit movement, due to the strong and flexible nature of the acrylic resin and formuation. Deep cracks can be bottom-filled with sand, foam backer rod, or cement. This helps to minimize the amount of crack filler needed. Plus, these are water-based products and they may have trouble properly setting up if the cracks are too deep and wide. If you bottom-fill the crack, try to leave an area approximately 3/4″ from the filler to the surface for the crack sealant to fill. This will provide enough surface area for the crack filler to adhere and form a strong bond. All of the crack fillers clean up with water. You can also use a slightly damp sponge or rag to help smooth the crack repairs before they are completely dry. This helps to reduce the amount of residual crack sealant on the playing surface for aesthetic and footing purposes. When using bagged concrete to back-fill a crack, you can use a 50/50 blend of water and SportMaster Acrylic Patch Binder to activate the cement. For example, if the bagged concrete says to add 1 gallon of water to a bag of cement, you and add 1/2″ gallon of water and 1/2 gallon of Acrylic Patch Binder. This is optional, but will provide more strength, adhesion, and flexibility to the concrete mix. All 3 of these crack filler products are available in multiple colors and also in a neutral version. The neutral versions can also be tinted by mixing in some of the desired color coating or ColorPlus Pigment Dispersion. They can also be painted or coated over with the color system. However, keep in mind that the elastomeric crack sealants (CrackMagic & CourtFlex) are designed to flex or stretch with the normal expansion and contraction of the crack. Eventually, the coatings may flake off of the crack filler from constant movement in the crack, exposing the crack filler in the void. This is similar to the analogy of “painting a balloon”. For best results, the method of tinting would be the best for color consistency. Before applying any of these water-based crack sealants, it is a good idea to look at the weather forecast and make sure that there isn’t lots of rain headed your way. Also, it is best to make sure that there wasn’t a lot of recent rain that could be saturating the ground beneath the court. 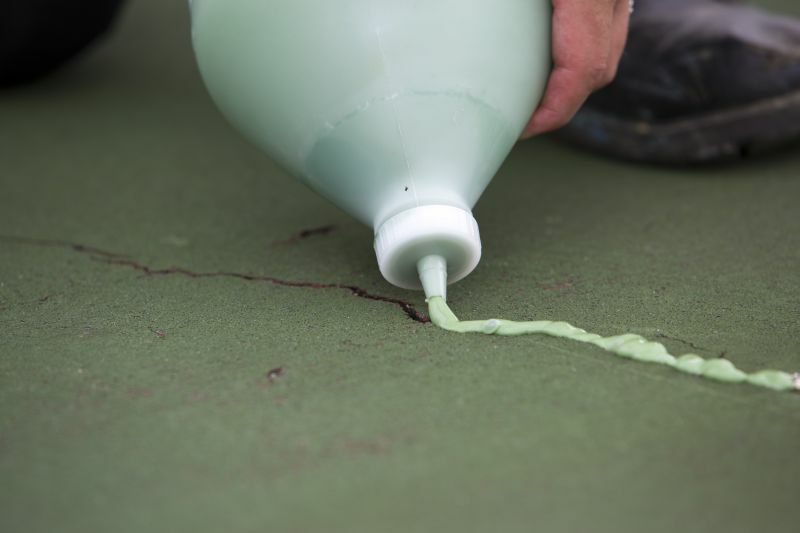 Cracks are the easiest way for water to escape from beneath the tennis court surface. If you apply a crack filler and there is still lots of water under the court, it will very likely wick upwards into the crack filler and slow down the drying. Even worse, it can weaken the crack filler by over diluting the acrylic binder and contribute to early failure. If you would rather leave your court repairs to an experienced tennis court contractor, we can refer you to qualified local tennis court companies that can provide free estimates on repair, resurfacing, and construction. Just visit our locate installer page and we will send you their contact information.